Like all of you, sometimes I have a hard time figuring out why something isn't working. Though I never lack for opinions on other people's spaces, often in my own home & garden I have to feel my way toward the solution. Case in point: the entry arbor from Valentine Cottage. It took me three tries before I got it right. Arbor #1 I chose the first arbor because it was white, wood and cheap ($110 on sale). Unfortunately, the minute I installed it I knew it was wrong. The flattish arch clashed with the home's round-arched entry. The diagonal lattice seemed too busy against the other elements. Worst of all, the too-short arbor made the entrance feel claustrophobic. Feeling guilty, I lived with it for two years before I gave it away. When I removed it, the garden seemed to breathe again. Unfortunately, I misunderstood why. Arbor #2 Thinking that the claustrophobic feeling was from the first arbor's bulkiness, I next chose an airy wrought-iron "look" bought on clearance for $35. It was taller and featured a round arch and square lattice. But it didn't work. 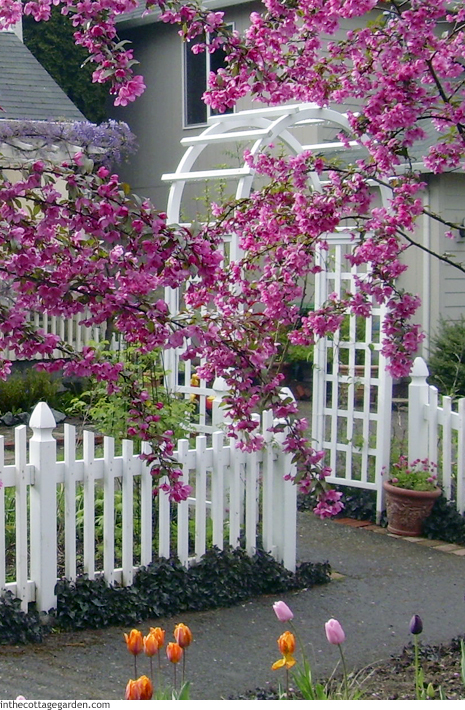 Next to the bold white picket fence, it felt wimpy and lackluster rather than welcoming. After a year, I moved it to the entrance to the side yard, where its "barely there" quality is an asset, providing support for climbing vines without demanding attention. Arbor #3 Finally, I got it right. Though this arbor was the most expensive, even on clearance ($133.50 down from $350.00), it was worth it. This arbor works for several reasons, the most dramatic of which I hadn't anticipated. I knew the square lattice and nice, tall (almost 7') round top would work. But I didn't realize it would make the yard feel both bigger and cozier. Since it is the same style, scale and material as the picket fence, it visually connects them, making one unbroken line. Now the two halves of the yard feel like one (bigger), but also completely enclosed (cozier). I never would have guessed such a simple thing would make such a big difference. I knew it wasn't right before, and I knew that when I got it right it would be better, but the profound way completely changed the feeling in the garden surprised me. It was one of those "a ha" moments that I hope to take with me into all of my new spaces. What about you? What's the best "happy accident," or unexpected benefit you've ever stumbled upon when designing a room or garden space? 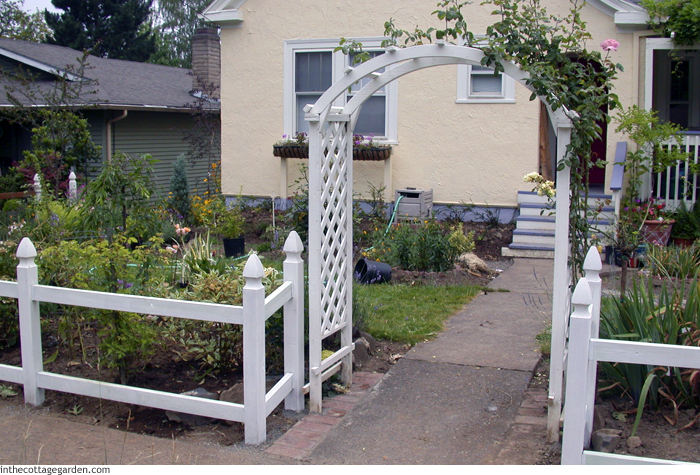 This article on selecting an entry arbor is part of the Gardening Gone Wild monthly workshop series for January: Garden Bloggers' Design Workshop: Arbors and Pergolas.